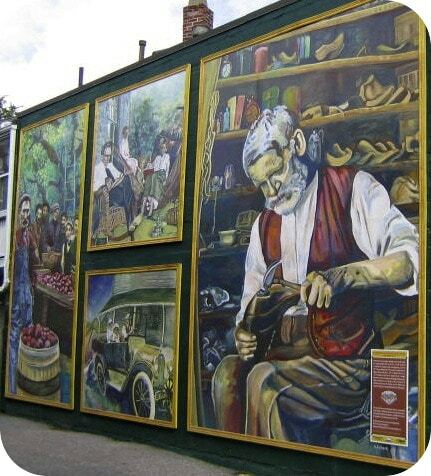 The mural is actually four separate works, each depicting a “slice of life” from our village’s past. These include: “Apple Packers”, Bigham family orchards ca. 1917; “Islington’s First Car”, a 1917 Chevrolet owned by the Appleby family; “Sunday Afternoon”, a scene showing famous Islington photographer, Walter Moorhouse’s own family on their veranda at 34 MacPherson Ave (now Aberfoyle); and the “Village Shoemaker”, Mr. Nelson, as he appeared early in the 20th century.